Looking for a new ride? Want a loaded and lightly used car for a substantially lower price than a new one? Today’s Find Of The Day, a 2014 Jetta GLI Autobahn, might interest you. As I type this, new MK7 Jettas are hitting dealerships across the country. Maybe you’ve even seen a 2019 Jetta commercial or two. And while we impatiently wait for the reveal of the next Jetta GLI, let’s take a look a great example of an MK6 one: this 2014 Jetta GLI Autobahn. While the GLI has always been the more serious sedan sibling to the GTI, the MK6 broke from the model’s history a bit. Starting with this version, the sedan moved a bit downscale while the hatchback moved a bit upscale. The hatch has a higher quality interior, a more evolved version of the 2.0T engine, and a few more bits and baubles than the trunked car. The GLI sports more room and a larger trunk. The GLI also doesn’t hold its value quite as well as the GTI. Which brings us to our find. This 2014 GLI is a honey of a car. It’s roughly 4 years old, and it only has 41,000 miles; that’s only about 10,000 miles a year. This is an Autobahn trim level car, so it is loaded: premium stereo, KESSY keyless system, navigation, sunroof, power windows/locks, etc. It also has an honest-to-God manual transmission. Enthusiasts rejoice! To add to the long list of features, this sports sedan is outfitted with great enhancements. The 2.0T engine has a Stage 2 APR tune, CTS diverter valve, and a USP downpipe. 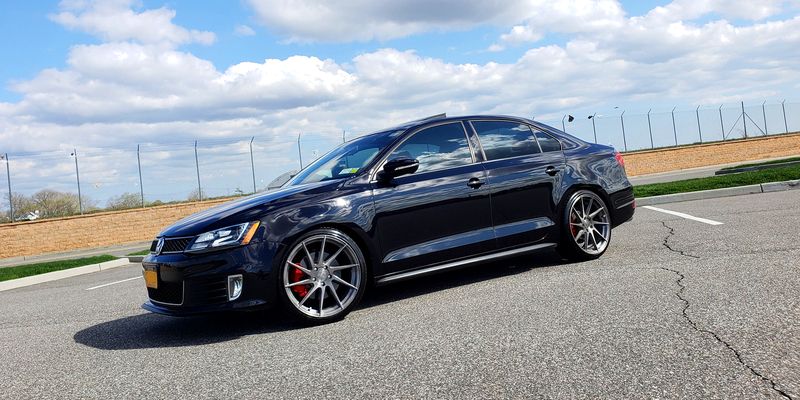 The GLI rides on H&R sport springs, 19″ Avant Garde wheels, and there’s 3M ceramic window tint. This car looks serious. If you’re in the market for a new car, why not consider a lightly-used but well-appointed used car? If used GTI prices have you down, consider its sedan sibling and save yourself some dough. VWVortex member VR6_Jetta_GLI is asking $16,500. Take a look at the ad in our classifieds, or see the car for yourself in Long Island, New York.